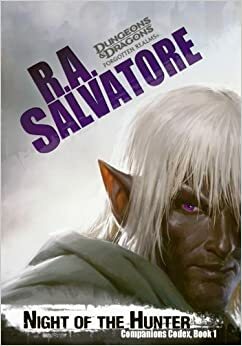 R.A. Salvatore’s New York Times best-selling saga continues as Drizzt Do’Urden and the Companions of the Hall join forces in an adventure filled with drow intrigue, the likes of which have not been seen in Salvatore’s work since the hugely successful the War of the Spider Queen series. With faithful friends by his side once again, Drizzt Do’Urden returns to Gauntlgrym, to find and turn Pwent, Bruenor’s loyal shield dwarf, from vampire back to mortal once again. But not only do he and his cohorts face a perilous journey through the Underdark and the dangers of the undead that lie within, but in order to do so, they must face a colony of drow and their leader, who would like nothing better than to see Drizzt Do’Urden dead. Night of the Hunter: Companions Codex, I by R.A. Salvatore debuts March 11th, 2014 and is available for pre-order at Amazon.com. Flames Rising is pleased to offer a short excerpt from this new Forgotten Realms novel from Wizards of the Coast. I came to travel with him, to trust him, even; does that mean that I came to believe that he had “changed”? Not really. And now that we have once more parted ways, I don’t believe there to be a fundamental difference in the man, compared to the Entreri I fought beside in the Undercity of Mithral Hall when it was still in the hands of the duergar, or the Entreri I pursued to Calimport when he abducted Regis. Fundamentally, he is the same man, as, fundamentally, I am the same drow. A person may learn and grow, and thus react differently to a recurring situation—that is the hope I hold for all people, for myself, for societies, even. Is that not the whole point of gaining experience, to use it to make wiser choices, to temper destructive instincts, to find better resolutions? In that regard, I do believe Artemis Entreri to be a changed man, slower in turning to the dagger for resolution, though no less deadly when he needs it. But fundamentally, regarding what lies in the man’s heart, he is the same. I know that to be true of myself, although, in retrospect, I walked a very different path over the last few years than that I purposefully strode for the majority of my life. Darkness found my heart, I admit. With the loss of so many dear friends came the loss of hope itself and so I gave in to the easier path—although I had vowed almost every day that such a cynical journey would not be the road of Drizzt Do’Urden. Fundamentally, though, I did not change, and so when faced with the reality of the darkened road, when it came time for me to admit the path to myself, I could not go on. I cannot say that I miss Dahlia, Entreri, and the others. My heart does not call out for me to go and find them, surely—but I am not so certain that I could confidently claim such a casual attitude about my decision to part ways had it not been for the return of those friends I hold most dear! How can I regret parting with Dahlia when the fork in our road led me directly back into the arms of Catti-brie? And thus, here I stand, together once more beside the Companions of the Hall, rejoined with the truest and dearest friends I have ever known, and could ever hope to know. Have they changed? Have their respective journeys through the realm of death itself brought to thesevfour friends a new and guiding set of principles that will leave mevsorely disappointed as I come to know them once more? That is a fear I hold, but hold afar. For people do not fundamentally change, so I believe. The warmth of Catti-brie’s embrace is one inspiring confidence that I am right. The mischievous grin of Regis (even with the mustache and goatee) is one I have seen before. And Bruenor’s call that night under the stars atop Kelvin’s Cairn, and his reaction to Wulfgar . . . aye, that was Bruenor, true to the thick bone and thick head! All that said, in these first days together, I have noted a change in Wulfgar’s step, I admit. There is a lightness there I have not seen before, and—curiously, I say, given the description I have been told of his reluctance to leave Iruladoon for the mortal world once more—a smile that never seems to leave his face. But he is Wulfgar, surely, the proud son of Beornegar. He has found some enlightenment, though in what way I cannot say. Enlightened and lightened. I see no burden there. I see amusement and joy, as if he views this all as a grand adventure on borrowed time, and I cannot deny the health of that perspective! They are back. We are back. The Companions of the Hall. We are not as we once were, but our hearts remain true, our purpose joined, and our trust for each other undiminished and thus unbridled. I am very glad of that! And, in a curious way (and a surprising way to me), I hold no regrets for the last few years of my journey through a life confusing, frightening, and grand all at once. My time with Dahlia, and particularly with Entreri, was one of learning, I must believe. To see the world through a cynical perspective did not hurl me back to the days of my youth in Menzoberranzan, and thus encapsulate me in darkness, but rather, has offered to me a more complete understanding of the consequence of choice, for I broke free of the cynicism before knowing what fate awaited me atop Bruenor’s Climb. I am not so self-centered as to believe that the world around me is created for me! We all play such self-centered games at times, I suppose, but in this case, I will allow myself one moment of selfimportance: to accept the reunion of the Companions of the Hall as a reward to me. Put whatever name you wish upon the gods and goddesses, or the fates, or the coincidences and twists that move the world along its path—it matters not. In this one instance, I choose to believe in a special kind of justice. Indeed, it is a foolish and self-serving claim, I know. It seemed just another day for Matron Mother Quenthel Baenre as she went to her evening prayers. Her magnificent black robes, laced like flowing spiderwebs, swirled around her as she regally moved along the center aisle, passing the inferior priestesses at the many side altars of the Baenre House Chapel. The slightest breeze could send the spidery ends of that robe drifting upward and outward, blurring the form of the matron mother, giving her the appearance of etherealness and otherworldliness. Quenthel’s sole surviving sister, Sos’Umptu, the first priestess of the House and keeper of the chapel, had preceded her to prayer this evening, and now prostrated herself, face down on the stone floor, legs tucked in a tight kneeling position. Quenthel considered that image as she neared, noting that Sos’Umptu had her forearms and hands flat on the floor above her head, up toward the altar, a position of complete supplication and apology, even, and not the typical form for daily prayers by the leading priestesses. A priestess of Sos’Umptu’s station rarely assumed so humble an entreaty. Quenthel walked up close enough to hear her sister’s chanted prayer, and indeed, it was an apology, and a desperate one at that. The matron mother listened for a bit longer, hoping to catch some hint of why Sos’Umptu would be apologizing, but caught nothing specific. “Dear sister,” she said when Sos’Umptu finally broke from her fevered chant. The first priestess raised her head and turned to glance back. Quenthel’s first instinct was to lash out at Sos’Umptu for her disrespectful tone and for daring to order her to do anything. She even put a hand to her snake-headed whip, where the five writhing, sentient serpents continued their eternal dance. She was surprised as she grasped the weapon, though, for even K’Sothra, the most bloodthirsty of the serpents, warned her away from that course—and rare indeed was it for K’Sothra to ever counsel anything but the lash! Hear her, purred Hsiv, the advisor serpent. Sos’Umptu is devout, Yngoth agreed. With the counsel of the serpents, the matron mother realized that only a matter of great importance would ever coax such irreverence from her sister. After all, Sos’Umptu was much like Triel, their deceased older sister, reserved and quietly calculating. The matron mother straightened her robes out behind her and fell to her knees beside the first priestess, face down, arms extended in full surrender. She heard the screaming—shrieking, actually—immediately, the discordant cacophony of demons, and of Lady Lolth herself, full of outrage and venom. Something was very much amiss, clearly. Quenthel tried to sort through the possibilities. Menzoberranzan remained on edge, as did most of Toril, as the world continued its realignment after the end of the Spellplague, some five years previous. But the drow city had fared well in that time, Quenthel believed. House Xorlarrin, Third House of Menzoberranzan, in league with House Baenre, had established a strong foothold in the dwarven complex formerly known as Gauntlgrym, and soon to be known as Q’Xorlarrin. The great and ancient Forge, powered by nothing less than a primordial of fire, had blazed to life, and weapons of fine edge and mighty enchantment had begun to flow back to Menzoberranzan. So secure did the new sister city seem that Matron Zeerith Xorlarrin herself had begun to make preparations for her departure, and had requested of Menzoberranzan’s ruling council that it approve the name Q’Xorlarrin for the new settlement, and as the permanent abode for her powerful House. Replacing that House on the Council of Eight could prove messy, of course, as was always the case when those Houses immediately below the top eight ranks saw a chance at ascendance, but Quenthel remained confident that she had those issues under control. Bregan D’aerthe, too, was thriving, with the resulting trade flowing in and out of Menzoberranzan. Under the leadership of Kimmuriel and Jarlaxle, the mercenaries had come to dominate the surface city of Luskan, and quietly, so as to not provoke the curiosity or ire of the lords of the surrounding kingdoms, particularly the powerful city of Waterdeep. The matron mother subtly shook her head. Menzoberranzan was operating quite smoothly under her leadership. Perhaps these screams were prompted by something else. She tried to widen her focus beyond the reach of Menzoberranzan’s tentacles. But the sudden shriek in her head left no doubt that Lolth’s anger this night was focused—and focused squarely on House Baenre, or at least, on Menzoberranzan. After a long while of accepting the telepathic berating, Quenthel lifted herself up to a kneeling position and motioned for Sos’Umptu to do likewise. Her sister came up shaking her head, her expression as full of confusion as Quenthel’s own. The source of Queen Lolth’s ire? Quenthel’s fingers asked in the intricate drow sign language. Sos’Umptu shook her head helplessly. Matron Mother Quenthel looked at the grand altar, its standing backdrop a gigantic drider-like figure. Its eight spider legs were tucked in a squat, and it bore the head and torso of a female drow, the beautiful figure of Lady Lolth herself. Quenthel closed her eyes and listened once more, then fell to the floor in supplication yet again. But the shrieks would not provide focus. Quenthel gradually came back to a kneeling position no less confused or concerned. She crossed her arms over her chest and rocked slowly, seeking guidance. She put her hand on her sentient weapon, but the serpents remained silent, uncharacteristically so. At length, she lifted her hands and signed to her sister, Get you to Arach-Tinilith and retrieve Myrineyl! “Sister?” Sos’Umptu dared to openly question. Arach-Tinilith, the training academy for drow priestesses, served as the greatest of the drow academies, elevated on Tier Breche above the school of warriors, Melee-Magthere, and Sorcere, the school for promising young wizards. Quenthel shot Sos’Umptu a threatening glare. I should retire to the Fane of Quarvelsharess, Sos’Umptu’s fingers flashed, referring to the great public cathedral of Menzoberranzan, one Sos’Umptu had been instrumental in creating, and in which she served as high priestess. I only visited Chapel Baenre so that I would not be tardy for evening prayers. Her argument revealed to the matron mother that Sos’Umptu thought the issue bigger than House Baenre, encompassing all of Menzoberranzan, and perhaps that was true, but Quenthel was not about to take the chance of allowing her House to become vulnerable in any way. No! Quenthel’s fingers flashed simply. She saw the disappointment on Sos’Umptu’s face, and knew it was more a matter of the reason for the ordered diversion to Arach-Tinilith than the delay in her return to her precious Fane of Quarvelsharess. Sos’Umptu was no friend to Myrineyl, Quenthel’s eldest daughter, after all! Soon to graduate from Arach-Tinilith, the whispers had already started concerning the expected struggle between Myrineyl and Sos’Umptu over the title of First Priestess of House Baenre, which was among the most coveted positions in the drow city. Up and down the chapel, the matron mother’s words were met by rising eyes, even rising priestesses, at the proclamation. Summoning a yochlol was no minor thing, after all, and most in attendance had never seen one of Lolth’s Handmaidens. The matron mother watched the expressions being exchanged among the lessers, wide-eyed, full of apprehension, full of excitement. “Select half the priestesses of House Baenre to witness the summoning,” the matron mother instructed as she rose. “Make them earn their place of witness.” She threw the train of her spidery gown out behind her and imperiously strode away, appearing the rock of confidence and strength. Inside, though, the matron mother’s thoughts roiled, the shrieks of Lolth echoing in her mind. Somehow, someone had erred, and greatly so, and punishment from Lolth was never an easy sentence. Perhaps she should take part in the summoning, she thought, before quickly dismissing the idea. She was the Matron Mother of House Baenre, after all, the unquestioned ruler of Lolth’s city of Menzoberranzan. She would not request the audience of a yochlol, and would only accept the invitation of one, should it come to that. Besides, high priestesses were only supposed to call upon one of Lolth’s handmaidens in a dire emergency, and Quenthel wasn’t completely sure that’s what this was. If not, and the summoning invoked the further displeasure of Lolth, better that she was not among those calling! For now, she decided, she should visit with the one she believed to be her only other surviving sibling, the Archmage of Menzoberranzan, her brother Gromph, to learn what he might know. The Elderboy of House Baenre, the first child of the great Yvonnel, Gromph Baenre now stood as the oldest living drow in Menzoberranzan, and had long before earned the distinction as the longest-serving archmage of the city. His tenure predated not only the Spellplague but the Time of Troubles, and by centuries! It was said that he got along by getting along, and by knowing his place, for though his station afforded him great latitude within Menzoberranzan, inarguably as the most powerful male drow in the city, he remained, after all, merely a male drow. In theory, therefore, every matron mother and every high priestess outranked him. They were closer to Lolth, and the Spider Queen ruled all. Many lesser priestesses had tested that theory against Gromph over the centuries. Even Quenthel, Matron Mother Quenthel herself, knocked lightly and politely on the door of the archmage’s private chamber in House Baenre. She might have been more showy and forceful had Gromph been in his residence in the Academy of Sorcere, but here in House Baenre, the pretense couldn’t stand. Quenthel and Gromph, siblings, understood each other, didn’t much like each other, but surely needed each other. The old wizard stood up quickly and offered a respectful bow when Quenthel pressed into the room. Quenthel took the seat opposite the archmage, across the great desk, which was covered in parchment, both rolled and spread, with a hundred bottles of various inks set about them. “Tell me of the Spellplague,” Quenthel bade him. Quenthel stared at him curiously. “Gloriously?” she asked, considering his strange choice of words, and one that surely seemed stranger still, given the typical demeanor of Gromph. Gromph shrugged as if it did not matter, to deflect his nosy sister. For once, regarding the movements of Lady Lolth, this situation did not yet concern her. For once, the male wizards of Menzoberranzan had been entreated by the Spider Queen before and above the domineering disciples of Arach-Tinilith. Gromph knew that his time standing above Quenthel in Lolth’s eyes would be brief, but he intended to hold fast to it for as long as possible. Quenthel narrowed her eyes, and Gromph suppressed his smile, knowing that his apparent indifference to such godly games surely irked her. “The Spider Queen is angry,” Quenthel said. “Your jests are noted, and will be relayed,” Quenthel warned. Gromph shrugged. He could hardly suppress his laughter. One of them would soon be exposing quite a bit of truth regarding the Spider Queen, he knew, but to Quenthel’s surprise, it wouldn’t be her. “Do not mock her,” Quenthel warned. “She lost,” Gromph said matter-of-factly, and he laughed at Quenthel’s threatening glare. “It’s not about that,” the matron mother said with confidence. “Matron Mother,” Quenthel sharply corrected. “Do you fear that the Spider Queen is angry with you?” Gromph went on. Quenthel rested back in her chair and stared off into nothingness, contemplating the question far longer than Gromph had anticipated—so long, in fact, that the archmage went back to his work, penning a new scroll. “At us,” Quenthel decided some time later, and Gromph looked up at her curiously. “The Spellplague, the Weave,” the matron mother flailed, again waving her hand. Gromph rolled right over the thought. “And act the part of it,” he said evenly. Quenthel’s eyes flashed again, her hands clenched and opened as if readying for a spell, but she quickly composed herself. Gromph nodded and gave a little laugh. “If the Spider Queen is angry with you and you show any weakness, your doom will fall,” he warned. “Their enemies the Xorlarrins are not far—Matron Zeerith is still within the city,” Quenthel protested. Quenthel slid back into her chair, mulling over that dangerous notion. A long while passed before she looked up across the desk at Gromph, who stood towering above her now. That seemed to satisfy the matron mother and she took her leave, and Gromph remained standing until she had closed the door behind her. Then he sat, with a profound sigh. He did not need a handmaiden to enlighten him. Another source, more ancient than he, had already told him of the stirrings of the Spider Queen and Lolth’s mounting frustration with Menzoberranzan. Quenthel would return to him shortly, he knew, and she would not much enjoy the journey he had planned for her. The handmaiden’s muddy voice, bubbly and scratchy all at once, fit its physical appearance, that of a half-melted blob of dirty wax, and with several tentacles waving around just to complete the nightmare. “You extend, but you are not strong,” the yochlol said, clearly irritated. Sos’Umptu and Myrineyl exchanged nervous glances. “We seek only to please the Spider Queen,” Sos’Umptu replied, her voice thick with proper deference and supplication. “She is pleased by strength,” said the yochlol. It was a surprising answer to both the priestesses, in that it did not include any variation or synonym to the word “chaos,” which was the very edict and domain of Lady Lolth. The gooey mass shifted then, turning slowly and thinning as it went. The tentacles shrank and became arms, drow arms, and drow legs, as the creature transformed into the guise of a female drow, naked and glorious. With a wry grin, the handmaiden walked over to Myrineyl and gently lifted her hand to stroke the drow’s cheek and chin. “Are you afraid, daughter of Matron Mother Quenthel?” the yochlol turned-drow asked. Myrineyl, now visibly trembling, swallowed hard. “We sense that the goddess is in pain, or in distress,” Sos’Umptu interjected, but the yochlol held up a hand to silence the older drow, and never turned her penetrating gaze from Myrineyl. The handmaiden’s hand drifted lower, around Myrineyl’s delicate jaw and gently, lightly, down her neck. The young Baenre seemed to Sos’Umptu on the verge of panic. Despite her misgivings regarding Myrineyl, Sos’Umptu lifted her hand into Myrineyl’s view and her fingers flashed the word Strength! “But you tremble at the touch of a handmaiden,” the yochlol replied. Sos’Umptu held her breath, knowing that if Myrineyl answered incorrectly, the yochlol would likely drag her back to the Demonweb Pits for an eternity of torment. But Myrineyl smiled, then suddenly embraced the handmaiden in a passionate kiss. Sos’Umptu nodded in admiration, silently congratulating the play of the young priestess. A long while later, Sos’Umptu and Myrineyl walked side-by-side through the halls of the Baenre main house, on their way to report to the matron mother. They had learned little from the handmaiden directly, which was typical of such encounters. “Why?” Myrineyl asked quietly. She didn’t have to elaborate. Sos’Umptu could have allowed her to fail the handmaiden’s test and been rid of her once and for all—and every drow in Menzoberranzan knew that Sos’Umptu Baenre would like nothing more than to be rid of Quenthel’s troublesome and ambitious daughter. “You thought it a test?” Sos’Umptu replied. Myrineyl stopped walking and considered the older priestess. “You think the handmaiden’s call for strength is aimed at you?” Sos’Umptu asked, and scoffed. “Is it inexperience, then, or stupidity that propels you? Or arrogance, perhaps. Yes, that would be a proper failing for a child of Quenthel.” For many heartbeats, Myrineyl didn’t respond, didn’t even blink, and Sos’Umptu could see her rolling the insult over and over in her thoughts, looking for an angle of counterattack. “You dare speak of the matron mother with such disrespect?” came the predictable retort. “The test was for me,” Sos’Umptu declared, and she started walking again, briskly, forcing Myrineyl to move swiftly to catch up. “And as such, for House Baenre wholly.” Myrineyl, who had, after all, just made love to a half-melted lump of dirty wax, wore a most delicious and perplexed expression. “When a handmaiden takes the illusion of a drow, does she see through the eyes of the drow?” Sos’Umptu asked. “Unity among the two nobles of House Baenre least likely to provide it.” Myrineyl’s eyes went wide. “Do you think that the rivalry between the high priestess of House Baenre and the daughter of Matron Mother Quenthel would go unnoticed?” Sos’Umptu replied. “I remain at Arach-Tinilith, serving Mistress Minolin Fey,” Myrineyl said innocently. “But you will never replace Minolin,” Sos’Umptu said slyly, “or Ardulrae of House Melarn as Matron of Scriptures. With those appointments, the matron mother, your mother, satisfies two rival Houses, potential enemies House Baenre prefers not to deal with in this dangerous time of House Xorlarrin’s departure. But then, you know this.” The innocent look was gone from Myrineyl’s face now, Sos’Umptu noted, the young priestess assumed a rather brash posture. “Unity now,” Sos’Umptu said against that threatening pose. “The Spider Queen demands it.” The words sounded quite curious to her as she spoke them, and to Myrineyl, as well, she realized when the younger priestess responded simply, “Why?” Sos’Umptu could only sigh and shrug against that all-important question. The handmaiden had revealed little, her largest hint being an obscure reference that “The Eternal would understand.” They had arrived at Quenthel’s door by then. Myrineyl lifted her hand to knock, but a look from Sos’Umptu warned her away. “Unity requires adherence to station, young one,” Sos’Umptu explained, and it was she who knocked, she who answered the matron mother’s call, and she who entered Quenthel’s private chambers first. Gromph smiled as his door swung open and, predictably, Matron Mother Quenthel swept into the room. “She taunts me!” Quenthel whined. She moved up to the chair she had previously used and started to sit down, but instead just kicked it aside. “The Eternal would know, the handmaiden whispered to Sos’Umptu and Myrineyl. The Eternal! Our mother would know, but alas, mere Quenthel cannot!” Gromph realized that his chuckle might not be appreciated at that moment, but he couldn’t hold it back. The reference, the Eternal, was clear enough, speaking of their mother, Yvonnel, who was known as Yvonnel the Eternal, the greatest matron mother Menzoberranzan had ever known, and one who had ruled the city for millennia. “Only because I know my sister to be wise,” he replied, moving to the left-hand wall of the chamber. There, he opened a large cabinet, revealing several shelves covered with various items: scrolls—so many scrolls!—coffers, sacks, and one large iron box. With a wave of his hand and a quick chant, Gromph cast a minor spell. A glistening, floating disc appeared beside him. He scooped out the iron box and placed it atop his enchantment. “Of course I only dare to tease you because I have the answer to your riddle,” he explained, turning back to Quenthel. “In there?” she asked, indicating the box. Gromph smiled all the wider. “I have been waiting for this day for a long time, dear sister,” the archmage explained. “Exactly. It is past time that you are no longer referred to in any other manner.” Quenthel rocked back a step, then sat in the chair, staring at the archmage. Gromph crossed the room behind her, to another cabinet near a display case. He opened the door to reveal a large, floor-to-ceiling mirror. The archmage closed his eyes and cast another spell, this one much longer to complete and much more intricate. The image of Gromph and the room in the mirror darkened, then disappeared altogether. “Come,” Gromph instructed, looking over his shoulder and reaching out for his sister’s hand. The disc with the iron box atop it floated up beside Gromph. “Where?” Quenthel demanded, but she reached out and took Gromph’s hand. “I just told you,” he explained, stepping through and pulling Quenthel behind him. The floating disc came in as well, and with a word from Gromph, the magical construct began to glow, illuminating the area and revealing an Underdark tunnel. “We are outside the city?” Quenthel asked, her voice a bit unstable. As the primary voice of Lady Lolth in Menzoberranzan, Matron Mother Quenthel was not allowed such journeys without a large entourage of soldiers and guards. “You are quite safe, Matron Mother,” Gromph replied, and his use of the proper title had the desired effect, drawing a nod from Quenthel. Quenthel started to reply, but stopped when Gromph pointed a wand out into the darkness of a side corridor and called upon its powers to create a small light in the distance, revealing a cave entrance blocked by lines of beads. The archmage started for it, the matron mother and the floating disc right beside him. Quenthel fell back when those beads parted at the end of a three-fingered hand, and an ugly biped stepped forth, the tentacles of its bulbous head waving excitedly. “An old friend,” Gromph explained. Quenthel steeled herself and stared hard at the approaching creature. Gromph took delight in her obvious disgust. Mind flayers were horrid creatures, of course, but this one was uglier still, having suffered grievous wounds, including one that left part of its brain-like, bulbous head hanging in a flap above its left shoulder. Of course she remembered—how could anyone who had been serving in House Baenre in the last decades of Matron Mother Yvonnel’s rule possibly forget this creature? Methil had served beside Matron Mother Quenthel as her secret advisor, her duvall, as the drow called the position. With his mind-reading abilities, so foreign to all but psionicist drow, which were very few in number since Matron Mother Quenthel had obliterated House Oblodra by dropping the whole of the place into the Clawrift during the Time of Troubles, Methil El-Viddenvelp had provided Matron Mother Quenthel with great insight into the desires, the deceit, and the desperation of friends and enemies alike. “But he died in the attack on Mithral Hall,” Quenthel whispered. “Kimmuriel,” Quenthel reasoned, nodding, and Gromph was glad that he had corrected himself quickly enough, and that Kimmuriel Oblodra, one of the few surviving members of the fallen House, an accomplished psionicist, known associate of illithids, and, coincidentally, currently one of the co-leaders of the mercenary band, had reasonably come into her mind. Kimmuriel had not even been involved in the efforts their brother Jarlaxle had expended in saving the grievously wounded illithid. But Quenthel didn’t need to know that—or to know that Jarlaxle was even related to them! “How long have you known about the mind flayer?” Quenthel asked suspiciously. Gromph looked at her as though he didn’t understand. “As long as you . . .” he started to reply. “How long have you known him to be out here?” the matron mother clarified. “Many months,” Gromph replied, though as he considered the question, he realized it had probably been many years. Normally such a spell would never have proven effective on a creature of such intellect, but when Matron Mother Quenthel uttered a command, it carried much greater weight indeed. That, perhaps combined with Methil El-Viddenvelp’s clearly diminished mental capacity, had the illithid skidding to an abrupt and complete stop. “Then why are we here?” Quenthel asked her brother pointedly. “Then why do you have that?” Quenthel asked, pointing to the box, and she even dared to edge closer and glance in once more at the horrid thing. “It would seem that I have preserved more than the physical head of our dead mother,” Gromph replied casually. “For, as I have learned from Kimmuriel Oblodra of Bregan D’aerthe, and he from the illithids, the physical mind is full of patterns, tiny connections that preserve memories.” As he spoke, he waved his hand, and the disc floated past Quenthel toward Methil, whose tentacles waggled insatiably. “You would not dare!” the matron mother said, to both of them. “I already have, many times,” Gromph replied. “To your benefit, I expect.” Quenthel shot him an angry glare. “On Lolth’s command,” came the damning reply, so easily and confidently spoken. Quenthel cried out, and she winced then and swung around, then fell back a step when she saw Methil leaning over the opened iron box, the creature’s tentacles waggling within it, waggling within the skull of Matron Mother Yvonnel Baenre, no doubt! “Are you trying to convince me, or yourself?” Gromph asked slyly, for they both knew the truth. Titanic events were going on all around them with the end of the Spellplague, and Lady Lolth herself was at play in the realm of arcane magic, Gromph knew, and yet, through it all, the denizens of Menzoberranzan had been mere spectators, after all. And while House Baenre’s hold on the city seemed as solid as ever at a cursory glance, the Baenre nobles knew the truth. The departure of House Xorlarrin, the Third House of the city and the one of greatest arcane power, was a tremendous risk that could bring great tumult to Menzoberranzan. Perhaps it would be seen as an opportunity for ascension to the ultimate rank by Matron Mez’Barris Armgo of House Barrison Del’Armgo, Baenre’s rival, who had long coveted the title held by Yvonnel and now by Quenthel. Appearances aside, Gromph knew it and Quenthel knew it: Menzoberranzan teetered on the edge of civil war. “Our friend is ready for you,” Gromph said. Quenthel looked at him curiously for a moment, then, catching the reference, her eyes went wide as she spun around to face the illithid, who was standing right behind her. Quenthel took a fast step away, or tried to, but Gromph was quicker, casting a spell of holding upon her—a dweomer that never should have taken hold on the Matron Mother of Menzoberranzan. Unless Lady Lolth allowed it, Quenthel realized to her horror as she froze in place. Still, she fought against the magic with all her strength, thoroughly repulsed, as Methil El-Viddenvelp’s waggling tentacles reached for her tender skin, touched her neck and face, slithered up her nostrils. Her expression became a mask of indignation, of outrage, and the purest anger Gromph had ever seen. He knew that if she found the power to break away at that moment, she would launch herself at him, physically and magically, to punish and bite and tear. She’d put her five-headed snake whip to work in short order, letting them strike at him, filling him with their agonizing venom, letting them chew into his belly and feast on his entrails. Oh, if only she could break free! But she could not, for Lady Lolth had sanctioned this most painful and profound lesson, and Gromph stood confident that by the time Quenthel was released, she’d more likely thank him than punish him. For now, though, there was violation at a most intimate level, an outrage at the most primal depth, and pain of the most excruciating sort. How she screamed! In terror and in the purest and most exquisite pain as the illithid did its work. Quenthel’s agonized wails echoed through the corridors of the Underdark. Night of the Hunter is available for pre-order at Amazon.com. This preview for was provided by and published with express permission from Wizards of the Coast.